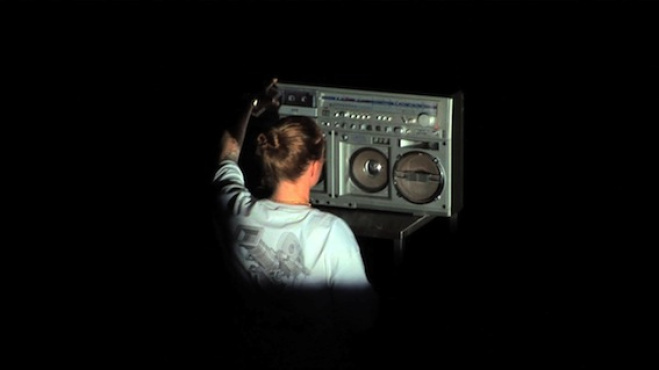 Charlotte Prodger’s microsphaeric howard hughes heaven movie (2014) begins with the sound of a meditation chime. A television monitor, DVD player and a portable stereo are each wheeled onto the stage of the dark studio theatre on custom-made stainless steel trolleys by two people, one of whom is the artist. Both are casually dressed. The artist is wearing a white T-shirt bearing an image of a movie camera with the words ‘Panavision London’ on the back. She has white Nike trainers on. Both cube TV and boombox, fetishised on their metal altars, are presented as though they are ceremonial objects. The monitor is placed stage left whilst the boombox is positioned stage right. A 16mm projector has already been installed a little distance away from the boombox. Audio narratives are played through the studio theatre’s inbuilt speakers. A large projection screen is centre stage. My attempt here to summarise microsphaeric howard hughes heaven movie in a linear way is not representative of the disjointed memories I have of the experience of the live performance at Tramway, Glasgow last September. Returning to the stalls of the studio theatre, my eye is drawn to the detail of the set – the tiny green light of the DVD player looking like the flickering light of the aeroplane. I only become aware that we have been sat in darkness when the light from the projector begins to cast a strobing white light. I become conscious of time as each narrative refers to it: ‘one year ago’, ‘two years ago’, ‘117 minutes’, ‘day 302’, ‘the final 50 seconds’. The technology described in the voiceovers and used in the performance creates strange overlaps and loops. Technological advancement runs contrarily: the artist describes a digital video of a man creating a Palaeolithic tool, his anachronistic activity shared through early twenty-first century technologies. Shifts also occur between the reality of an object and its trace: the boombox on the stage is also in the film. The artist appears on stage at the beginning of the performance, but it is the recording of her voice that is with us the longest. I become alert to the receptivity of my body. When a beat is played at optimum volume in the final section of film, I feel it in my gut. I have no idea what you’re constructing, but that thing you’re working on and your tools are so beautiful that I’ll just go ahead and watch all the videos – Innuya 1 year ago. Brain-feet-hands-face-tools-language. Stiegler follows the trajectory of human evolution, tracing the development of the body as symbiotic with that of technology. 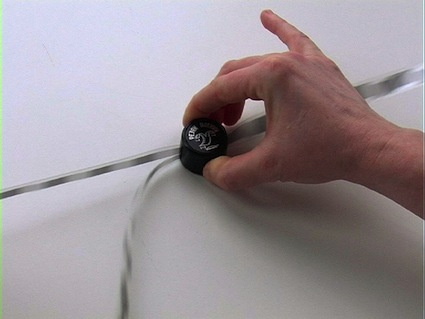 A subsequent reading of the context of this excerpt makes the connection more explicit, with Stiegler stating, ‘the human invents himself in the technical by inventing the tool’.4 He also refers directly to the biface – the first technology that humans see themselves within: ‘Flint is the first reflective memory, the first mirror’.5 The artist herself bringing on the equipment before turning it over to the machines, the links suggested between hands and tools, the shifts of attention prompting physical awareness on the part of the viewer: the performance plays and replays Stiegler’s proposition. Upon arrival at microsphaeric howard hughes heaven movie the audience was given a sheet of paper with a caption and fifteen-entry list detailing the makes of equipment used, and references for the video and sound files included in the performance. Holt’s Sun Tunnels are animated by specific light conditions: during the sunrise and sunset on winter and summer solstices, the sun is exactly centred through the tunnels, creating concentric circles of cement and light. Lucy Lippard has suggested that Holt ‘tapped a lyrical vein within steadfastly “objective” forms.’8 This lyrical vein also runs through Prodger’s work. Sensorially the flickering white light of the 16mm projector feels like the blinding rays of a bright sun. The personal nature of the content used for much of the voice-overs in Prodger’s work also engenders an intimacy with the audience, as they narrate the experience of a flight, a nightclub or the swapping of shoes under a table. Like Prodger, Holt has also used first-person spoken word to articulate the relationship between the body and technology. In Richard Serra and Holt’s Boomerang (1974), Serra films Holt as she speaks in a studio set-up and simultaneously hears her own electronically delayed words as feedback. She describes the experience as it happens: ‘The light hits me and reflects off me into the camera. The words leave me and are reflected into my ear and your ear.’ This video was made for public broadcast, adding to the dislocation between the ‘live’ experience on television and the real-time action in the studio. Holt concludes: ‘The time in this isolated capsule of television experience is cut off from time as we usually experience it.’9 When the microsphaeric howard hughes heaven movie ends, when the increasingly frenetic bombardment of sound and light stops, the audience are disorientated and continue to sit in a similar trance to the traveller on the plane. Like the stewardess in her story, the artist recognises what is happening and has to tell us the experience is finished so we can go out into the night.